A famous crispy savory snack of South india, Ribbon pakkavada is made with rice powder, chickpea powder, butter and spices. The dough for pakkavada is then deep fried in hot oil using idiyappam moulds attached with pakkavada discs specially used for making shaped pakkavadas. In a bowl, add rice powder, chickpea powder, salt, chilli powder, pepper powder, cumin powder and asafotedia. Mix well. Now add warm water and melted butter. Knead this into a smooth dough by adding water little by little. (The dough should be soft in consistency and nonsticky). Keep this aside. 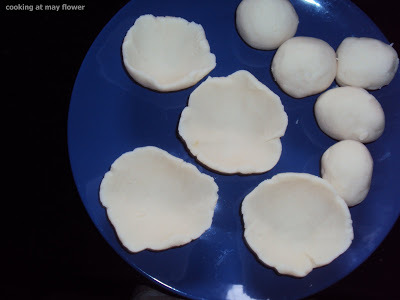 Prepare the idiyappam mould by greasing some oil and placing the ribbon pakavada slit disc inside. Now fill the mould with the dough. Heat oil in a pan. Press the dough on to hot oil in circular motion. Fry until it is golden yellow in colour. Allow it to cool completely. Store in airtight containers. During oshana, kozhukatta is prepared in Christian households. Melt jaggery with water and strain it to get a jaggery syrup. Add grated coconut to the jaggery syrup and stir well. Add ghee and cook till all the liquid is dried out. Add crushed cardamom and remove from fire. Keep this aside. In a pan, boil water with salt and ghee. Add rice flour little by little and mix it with a spoon until water is absorbed by the flour. Keep this aside. When you can handle the dough make it to soft balls, The consistency of the dough should be same as that of idiyappam dough. Coat oil in your palm. Take one ball at a time and place it in your palm. Press it with the finger and to make the shape of a deep bowl. Place 1 tbsp of the filling. Cover it and roll it back into a ball. Repeat the process with the rest of the dough by filling it with the mixture. Steam kozhukatta in a steamer for 9-10 minutes on medium flame. When done, keep it covered for 1 minute, then open and serve hot. Try this homemade egg puff using wheat pastry squares. Totally yummy! Heat oil in a pan. Add onion, ginger garlic paste and curry leaves. Saute well. When onion turns light brown in colour, add chilli powder, pepper powder and garam masala powder. Saute on low flame. When the raw smell of masala leaves, add ketchup and salt. Switch off the stove. Cut the cooked eggs into halves. Take one puff pastry square. Place 1 tbsp of cooked onion masala, top it with one egg half. Fold the corner of the squares with a rub of water to seal the corners so that it stays intact (as shown in the picture). Place the puff pastry on to the baking tray. Brush the top of the puff pastry with egg wash. Preheat the oven to 190 degrees. Bake for 25 minutes or until it turns golden brown. Serve hot with a cup of tea. Preheat the oven to 180 degrees. Line a 9 inch round cake pan with wax paper. In a large bowl, beat butter and sugar with an electric mixer at medium speed until creamy. Add the egg and vanilla, beating until just blended. With the mixer at low speed, gradually beat in the dry ingredients alternating with the milk. Spoon the batter into the prepared pan . Bake for 20- 30 minutes or until pale golden brown and a tooth pick inserted into the center comes out clean. Cool the cake in the pan for 10 minutes. Turn out on to the rack. Carefully remove the paper and turn the cake top side up. Brush with the butter and sprinkle with the sugar and cinnamon. Serve warm or cold. Avalosunda is a traditional Christian snack from Kerala, which is served during Christmas and on weddings. Keep aside 1 to 1 1/2 cups of avalose podi from 1 kg for rolling. In a pan, add jaggery with one cup of water and cook until the jaggery melts. Now pass through a sieve to remove any impurities in the jaggery syrup. Now place the jaggery syrup on another pan (uruli) and reduce the syrup to one thread consistency. Add cardamom powder and ginger powder. When it comes to a boil, add 3/4th of avalose podi prepared before. Stir well and switch off the stove. Now roll this into balls when it is still hot (this is very important, otherwise it is difficult to roll). If the mixture has become cold, place this on to the stove and reheat. Roll the prepared balls into 1 to 1 1/2 cups of avalose podi, which is kept aside. Place this in airtight containers to keep it fresh. 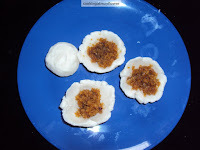 snack made with rice and grated coconut. Other famous christmas snacks are Achappam, avalose unda, kuzhalappam, diamond cuts, kulkuls, etc. Soak raw rice for 3-4 hours. Drain the water completely. Grind it to make a coarse powder like puttu podi. In a vessel, mix ground rice flour, grated coconut, cumin seeds and little salt. Using your hands mix the above mixture well. Keep for 1/2 to 1 hour. Heat a wide and heavy bottom pan. Add the above rice coconut mixture to the pan. Fry on medium heat stirring continuously. It will take about 30-45 minutes to get it done. You have to stir continuously to avoid getting it burned, When the mixture turns light brown in colour, switch off the stove. Transfer this from the stovetop. Leave this to cool down. Then transfer this to an airtight container. Avalosu Podi is eaten with ripe banana mashed and a sprinkle of sugar. Avalosu Podi is used to make avalos unda, which is a mix of avalosu podi with jaggery or sugar. Rava/Semolina Kesari is one of the famous South Indian sweet perfect for any celebrations. Here I have made kesari with grated beetroot, semolina, sugar, ghee and cardamom powder. It is very delicious and colorful. Heat ghee in a nonstick pan. To this, add rava and fry. Don't allow to change colour. When semolina is roasted, add grated beetroot and saute for 5 minutes. Now add 1 1/2 cups of water to this and cook in low flame. Once semolina is cooked, add sugar and saute well. When it starts to get thicken, add cardamom powder. Smear some ghee in the moulds. Fill this with kesari and remove from the moulds. Decorate with nuts of your choice.